More and more foreigners find China a charming country full of opportunities. Lots of travelers and international students, who are enchanted by its beautiful scenery, luring delicacies, safe environment, convenient transportation, prosperous economy, and friendly people, would rather stay and work in China than return home. 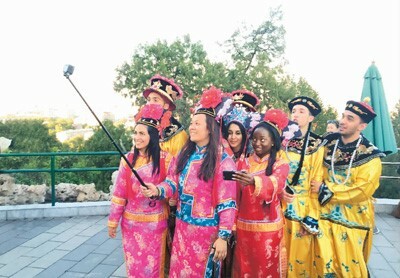 Statistics from the China National Tourism Administration show that the number of inbound tourists has exceeded outbound tourists in the first half of 2017, reaching 65.1 million, a year-on-year increase of 4.5 percent, and the number of foreigners with permanent resident status is up too, a year-on-year increase of 163 percent in 2016. Eighty Italian workers have unforgettable memories near West Lake. Two years ago, they flew 15 hours from Rome to Hangzhou to complete a construction project. Frank is one of the eighty workers. In his eyes, Chinese workers have clear lines of division between life and work. “We magically communicate with Chinese workers through gestures and facial expressions and have built a good relationship,” he said. They often watch games, play basketball, and have barbeques together. Dina Elhadi is a beautiful Egyptian girl who has just received her doctoral degree from the School of Life Sciences at Tsinghua University. She fell in love with China because of the kindness, charm, and hospitality of the people in Beijing. “There are many elderly people at my university. At first, I could not express myself properly, but they always listened to me carefully and sometimes even joked with me,” she said. In her eyes, Chinese people are warmhearted, optimistic, and always positive. Natural beauty, history, and culture are top attractions for foreign travelers in China. For most people, the latter is more favorable. Wang Shaocong is from Cuba. His Chinese name was given to him by a teacher at a Confucius Institute in his home country. “I love Chinese culture, especially the unparalleled artistic beauty of calligraphy and water-ink paintings. They always relieve pressure and help me feel calm and relaxed,” said Wang. He considers Beijing a paradise for “exhibitions” and has left footprints in many art places, including the National Art Museum of China and the National Museum of China. “I love reading the Romance of the Three Kingdoms (one of the four iconic classical Chinese novels) very much, it’s fascinating,” he said. To better experience the country’s profound history, Wang has also visited many ancient places in Beijing, such as the Palace Museum, the Summer Palace, and the Drum Tower. Chinese food is famous for its taste and diversity. Lee Hye Ran, a Korean girl who graduated from Peking University, now has more than 200,000 followers on Chinese social media platform Sina Weibo. She is an active beauty blogger. Lee could not understand a single Chinese word when she first arrived in China. She studied Chinese hard from the very beginning and for a long time has had to taste the bitterness of being alone in a foreign country. “I had many troubles at that time. Although I have many international classmates, it was my Chinese friends who helped me the most. We are still in touch,” she said. Lee has set up her own skin care and beauty company. She feels happy living in Beijing. “I love this place, it is like my second home, and everything here is comfortable,” she said. Stefan, a German citizen who teaches at a university in Beijing, studied at the Beijing Language and Culture University in the 1980s. He has seen China’s great changes during his two visits to the country ten and twenty years later. Having known China for more than 20 years, he is now able to speak Chinese very well. “I often have discussions about football with my students after class. They care about Bayern and Dortmund, and I sometimes talk about Beijing Guoan,” he said with a smile. He admired Chinese students’ intelligence and diligence, and always encourages them to do what they want. “I can see China’s hope and future from these young people”. Vietnamese girl Lam Thiên and Indonesian girl Sandra are two postgraduate students in China. Li Chenyang contributed to this story.